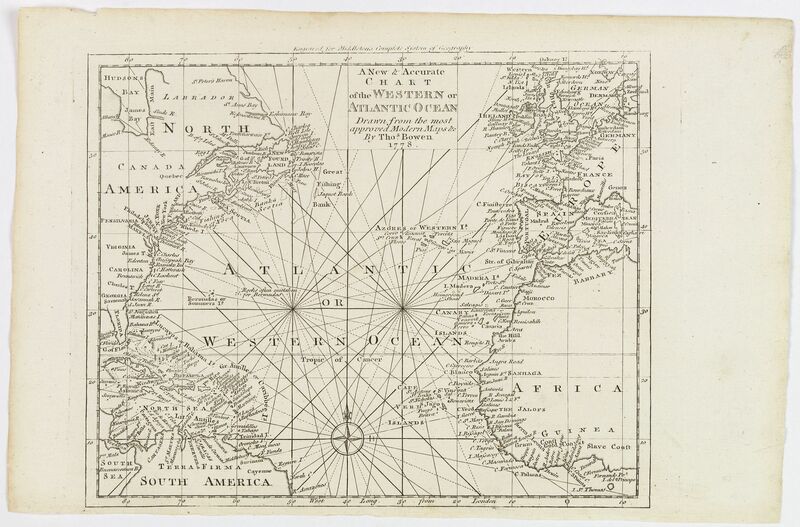 Old map by BOWEN -A New & Accurate Chart of the Western or Atlantic Ocean. Title: A New & Accurate Chart of the Western or Atlantic Ocean. Size: 8.5 x 10.4 inches. Condition: In good condition. Top and bottom margins are uneven. Dark impression. A map from 'Middleton's Complete System of Geography', from the Arctic Ocean in the north, south to the top of South America and across to the Slave Coast of Africa. From Florida and the Caribbean Islands in the west to northern Europe in the east. A compass rose and rhumb line allude to a nautical leanings, little inland detail is shown, however, many ports, harbors, towns and coastal information is engraved.